Rabbit is one of the most sensitive pets. They are frequently exposed to harsh weather conditions; they cannot survive in the heat while resisting cold is also a difficult part of their lives. If you have rabbits as pets, you should take their care in all weather extremes, particularly in harsh winters. They can quickly be frozen to death if left exposed outside, particularly at night in winters. The hutch itself is not a solution to harsh cold weather unless it is made at a place that is well protected from cold winds and freezing temperatures. You should not leave rabbits outside of your house or their hutch unattended for even a while in the cold. Since they are very sensitive, they can quickly catch cold, or cold-related illnesses or die immediately. You always guide them to their hutch or inside your house if you have any arrangement for their protection in the house. Building just a hutch itself is not enough for protection of rabbits against the cold weather. The hutch should be built at a place that is protected from cold winds and temperature is up at a cozy level. It is better if the hutch is built of wood, because wood offers better protection against the cold winds and helps keep a temperature at a right level. 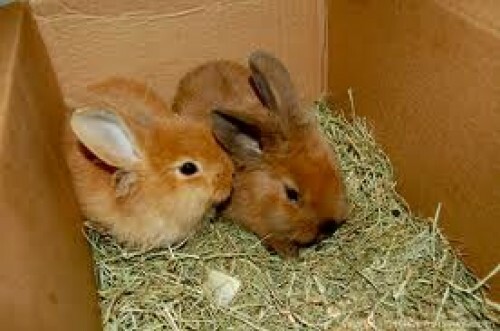 You can also cover the rabbit hutch in cold weather conditions with a sheet or any warm material, may be some dry grass. This will protect the hutch against all cold conditions and warm up hutch at night. You can remove the covering in summer, when hutch needs more fresh air. You can also use some dry wood panels to build a solid removable covering on the hutch. Also, you can use some dry grass for the flooring in hutch. You should not let your rabbit get wet at all costs. If the animal gets wet, it is more likely to die sooner than later. Its fur is the main protection and helps maintain warmness in the body, and once it gets wet, the cold weather is going to rip through the pet's organs. Try some immediate solutions to dry your rabbit if it gets wet in any scenario.